An homage to classic bedtime stories and their creators, from a Caldecott Honor recipient and bestselling artist! 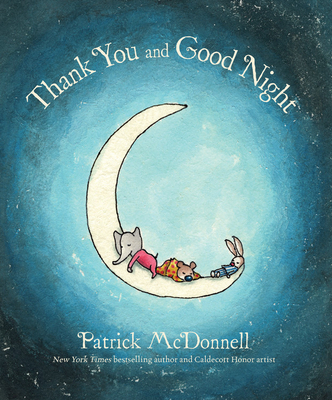 Patrick McDonnell is the author and illustrator of Tek: The Modern Cave Boy, Thank You and Good Night, A Perfectly Messed-Up Story, The Monsters' Monster, and Me...Jane, a Caldecott Honor Book. He is also the creator of the internationally syndicated comic strip Mutts, which inspired his picture books The Gift of Nothing, Hug Time, and others. He lives in New Jersey. *"This picture book's satisfyingly soft illustrations...feel just right for its plush language and darling characters and content.... Small listeners will nestle deep under their covers feeling thankful for tender books that make bedtime a pleasure." *"The book's simplicity, gentle rhythms, and easy patterns make it perfect for bedtime reading.... Youngsters who love their stuffed animals will particularly latch onto this, and parents who want to promote nocturnal tranquility (or those with their own fond memories of Pooh Bear) will appreciate this little gem as well."